Grapes for me is the fruit that symbolizes fall, probably because of the harvesting of the grapes in France (vendanges). Today, I wanted to feature a very simple French dish using grapes and combined with salmon, and this one turned out much better than it used to, probably because this time I cooked the salmon skin up and not down (touching the pan). So if you have some salmon and want to try something quick and new, this would be a good choice. Usually, I do not combine fruits and fish, but it works very well in this case. The grapes don’t have a strong flavor, and their slight sweetness associated with the acidity of the wine and crème fraîche balances the dish very well. You can use scallops instead of the shrimps, and substitute white fish to salmon. I bet most of you must be getting ready for Thanksgiving with all the food preparation and planning, so this salmon would be perfect after you’re done with the festivities and the turkey. I know Thanksgiving is a huge celebration in the US, when the families gather and get together around a traditional meal. For us, it’s more like an opportunity to have a dinner with friends, since everyone is off, and right now I still haven’t figured out what I will have for dinner. I have absolutely no idea…I can always serve this salmon, and see the look on everyone’s face when instead of a beautiful golden the turkey, I bring out salmon. I don’t think I’ll have the guts to do that! So if one of those nights, you’re up for quick, easy and delicious, voilà! you got your meal! Peel and remove seeds from grapes. Heat 1 tbs olive oil in a pan and add shallots. Cook slowly until soft. Add shrimps, let them cook both sides, then add grapes, wine and fumet. Let the sauce reduce to half. Add cream, salt and pepper. At the same time, in a non stick pan, cook salmon in 1 tbs olive oil about 2 minutes on each side, or longer if you like the salmon well done. 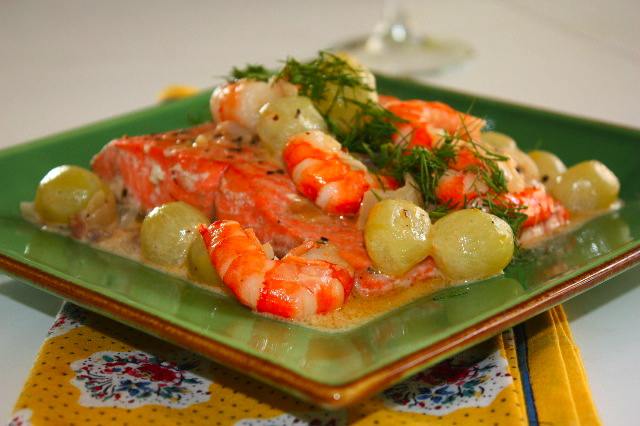 Place salmon in a plate, arrange shrimps and raisins, all around, then pour the sauce on top. Decorate with dill. This entry was posted by silvia on November 23, 2010 at 4:34 am, and is filed under Express - Less than 30 minutes, Fish/Seafood. Follow any responses to this post through RSS 2.0.You can leave a response or trackback from your own site. Well I will say it again, your presentation, color, and photography gets better and better with each visit! Sensational hope your well my friend…another great dish! I love the simplicity of the dish but also the combination of fish with grapes. I wouldn’t have thought to put them together but I am very excited to give it a try. J’aime beaucoup cette idée d’associer le saumon et les raisins. Ça doit être assez surprenant! En plus, la présentation est superbe! You’re absolutely right – this light and flavorful salmon will be perfect after Thanksgivings rich feast! I made chicken with red grapes for the first time this past weekend and enjoyed the slight sweetness that the grapes added. Beautiful presentation and photos as always! Beautiful dish Silvia. I would love this for Thanksgiving, save the turkey for Christmas. The grapes are beautiful with the fish and the simple sauce is light and wonderful. What a unique idea! I’ve never thought of combining fruit and fish before, but this recipe looks too beautiful not to try! Thank you for sharing such an innovative and flavorful dinner meal. What an interesting and beautiful dish! I love the idea of cooking with grapes–although the thought of pitting and peeling usually keeps me away. This dish has all my favorites things! Nice colorful presentation. Congrats on Top 9 today! Gorgeous! Yummy and great looking. Lovely salmon dish, Sylvia! Grapes are our family’s favorite right now and i’ve been peeling a few for the baby. Do I dare peel some for us to enjoy with salmon??? Thanks for an elegant recipe. Have a wonderful dinner tomorrow. Salmon is one of my favorite foods, specially the Norweigan one. White grapes as a combination – sounds like good idea! Oooooo! I l.o.v.e. it! I never would have thought of this combo but now that you mention it, or maybe it’s the mouthwatering photos, I can not only imagine it but have to have it right this minute! Seriously! I love salmon but cook it the same 2 or 3 ways always. I am soooo excited to try this recipe! Very interesting thought on cooking it skin up, I’ll give it a go. What exactly made it better? Moister? Beautiful presentation. The combination of the grapes and shrimp in the sauce sounds delicious. Hey Silvia! I can just imagine how well this works. Such an exquisite dish for fall! I’ve missed a couple of your posts but it made for a nice read catching up just now. Salmon is a staple in my home but I admit that I’m stuck in a rut–I always prepare it the same way. This would be a good, new thing for me to try. When you said “simple”, I knew this recipe was for me. have a wonderful Thanksgiving Silvia. We have so much to be thankful for. fabulous recipe,as usually,gorgeous photos!i wish you a great thanksgiving day! superbe présentation ; je n’ai jamais essayé de cuire des raisins et après ceci, l’idée me tente! Salmon and grapes…delicious! I love the touch of creme fraiche. I bet this tasted exquisite:)beautiful. 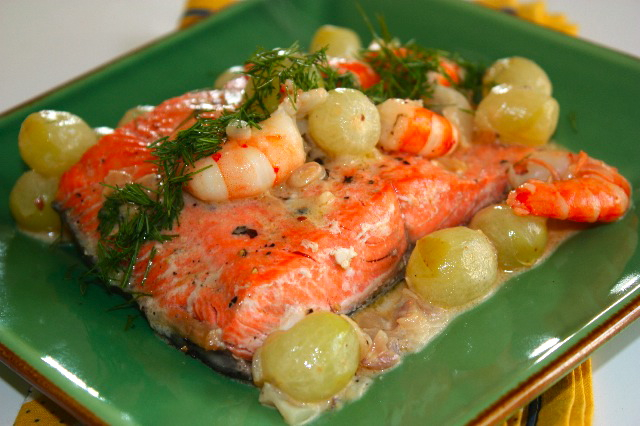 Silvia, what a nice way to serve salmon…with grapes…I love the idea of adding natural sweet to the dish…lovely! Silvia, this looks like it is TO-DIE-FOR! The photographs are outstanding and the recipe is simply divine. I have missed your site… and may I again ask you to pawl-eeese consider uploading the “subscribe 2″ plug in (if you use WordPress) or Feedburner so that I can subscribe to your site and never miss a post as they will be delivered into my mail box? Thank you for the inspiration – as always. Beautiful dish…salmon is my weakness I have always loved fruit with fish. Happy Thanksgiving! You have come out with my 2 top favorite combined….salmon & shrimps!! Drooling…drooling…drooling! Silvia, trust you are well and have a wonderful day each day. I have been reading all about Christmas cookies tonight, and I feel like I should lace up my running shoes after all of the butter and sugar I just consumed with my eyes. Glad to stop here for something light. Sounds so good Silvia! This looks so lovely, Silvia. I must confess that I have never cooked with grapes before – but I really must try! What a beautiful dish! Justement moi qui ne sais jamais comment cuisiner mon saumon ,je me ferai un plaisir dessayer cette recette . joli blog .